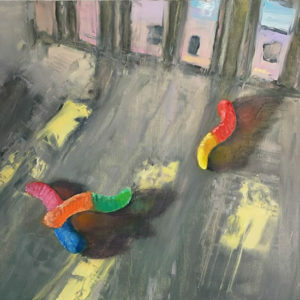 Two paintings from Michelle Eccles’ Bittersweets series have been selected for Treat Gallery’s most recent pop-up exhibition: Sweet Spot. The one-night-only exhibition will also feature work from: Allison DeBritz, Laura Miner, Bryan Northup, Anthony Papini, Kristin Kempa, Lorryn Moore, Wren Caroline Gardiner, Dane Stahr, John Murray, Emily Duong, Brittany Schmid, Joshua Newth and collaborate team Bubblegum & Whiskey. Artists were challenged to answer the following question: What’s your Sweet Spot? Personally, we like treats. Desserts are a last impression, and can be the most memorable part of a meal. They’re a work of art in themselves: colorful, beautiful and baked to perfection. No one needs dessert to survive, but that doesn’t stop us from looking forward to enjoying our next one. We congratulate others with sweets. We celebrate life’s accomplishments and milestones with cake. We even grieve with ice cream. What do you fancy? What gets you through? Sweet Spot will be held at the Court Tree Collective, located at 371 Court Street (2nd floor); Brooklyn, NY, on Friday July 1st, from 6:30-8:30pm. 30% of proceeds from the exhibition will be donated to New York City-based “End to Cyber Bullying,” a non-profit organization aimed to combat bullying online.